Behold & Reflect: Jesus Asks: Do you want to be made well? This is the 22nd post in my series "Asking Myself," in which I weekly ponder one question posed in Teresa Blythe's rich book, 50 Ways to Pray. You can find the start of the series here and last week's post here. The first nine posts focused on theological musings, while posts 10 to the present prayerfully consider the specific questions Jesus posed in the New Testament. Q: Do you want to be made well? The protagonist: A man among them has been sick for 38 years. It seems he's spent most or all of those long years lying helpless on the porch. The conflict: Only the first into the water can be healed, and he's never first. Everyone else is jumping the line. The question matters. It implies that someone might not want to be well after all. I'm open to and have even experienced some healing through non-conventional medicine. But this story still strikes me as a little odd. The pool angel at Bethesda seems more like a holy quack doctor than God's special provision. Not only is she unreliable, but she causes the masses to fight over the bubbling waters. Why would an angel of the Lord be stingy and cause sick people to wrestle with each other, to grab their own healing at the expense of the others' healing? It's hard for me to reconcile this kind of Lord with the Lord Jesus. With those thoughts in mind, I lean toward seeing this as an ancient urban legend or a giant placebo effect or simply a case of the fittest people who make it into the water first were also the ones least in need of healing. Those with the really bad diseases didn't ever get into the pool, so no one could disprove its healing properties? I don't like this part of the story much, and apparently I'm not alone. Verse 4 is omitted from my NLT version probably because the translators had the same reservations about these details that I've always had. Another impression I have is that the lame man has grown used to his 38-year vacation/exemption from normal life. There he is, lounging, languishing, feeling sorry for himself on the patio, by a pool. Being paralyzed isn't fun, but perhaps the false-freedom of not having anyone expect anything of you isn't so bad. If you've got kids, you might liken this to the unnecessarily long time you spend in the shower, with the bathroom door locked, unable to hear your kids killing each other through the sound of the rushing waters. 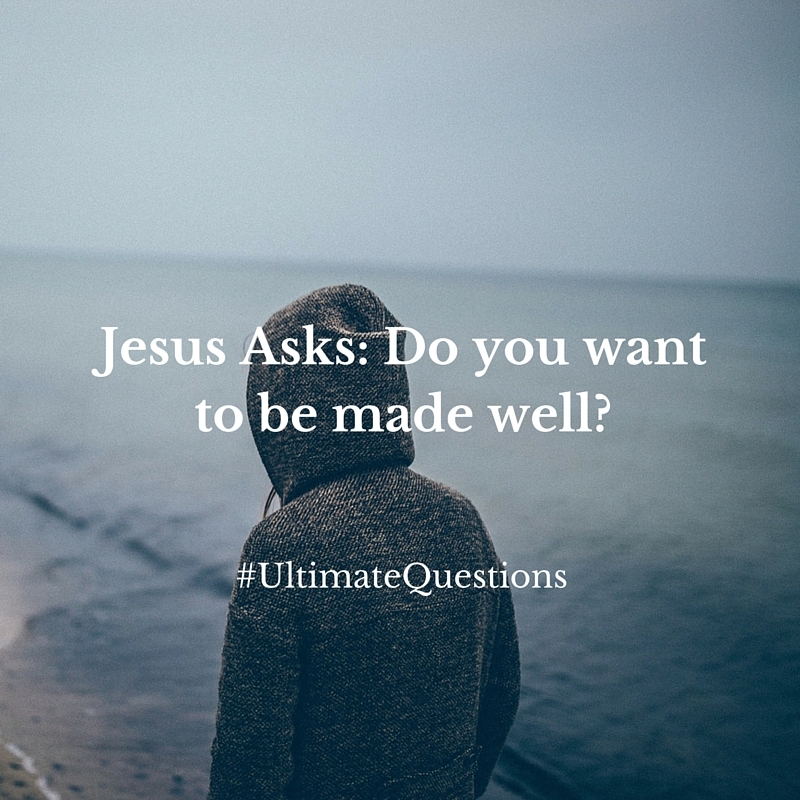 Jesus asks "Do you want to be made well?" Perhaps there's the implication that the lame man doesn't want to get well. In fact, he has decided to die there. Maybe it was a passive decision. Having grown accustomed to the crowded isolation of the porches and pool he can no longer face the thought of returning to the normal responsibilities of life. Or perhaps the decision is more vindictive. Maybe he secretly wants his stinking corpse to stick it to all those who didn't help him enough. To make the road to recovery a little more punishing to those who are more apt, able, or more motivated to get to the angel-stirred pond. It's a slow suicide, a public protest for all to see. But no one really sees or cares. Until Jesus sees him and asks. But the man evades the question and instead complains his excuse. I can't get the healing. They jump the line and steal my chance every time. The man is so reconciled to the idea of never being made well that he doesn't recognize Jesus' offer. He takes the opportunity to complain and blame instead. Jesus doesn't skip a beat and tells the man to rise, pick up his mat and walk. And... HE DOES! Miraculous healing is cause for celebration, but the story is still bitter sweet to me. For one, I find the protagonist unendearing. Even after he's healed, he doesn't thank Jesus or even ask for the kind stranger's name. When the Pharisees question the man later, he even uses Jesus as his scapegoat for breaking their Sabbath rules.... which, apparently include not carrying any personal possessions? Armed with Jesus' identity, and perhaps a little provoked by His warning, the man uses his newly healed limbs and runs off to the Pharisees to tattle in full. When I read this, I definitely have a judgy moment or two. But at the same time, I can love Jesus all the more for loving someone so decidedly unlovely. Jesus' warning is also puzzling. I don't think Jesus is actually threatening the man. I don't think he's even characterizing God as someone who punishes sin with physical lameness. Just a few chapters later (John 9), Jesus debunks the religious idea that sickness is the scarlet letter of sin when he heals the man blind since birth. It's not the man nor his parents that brought on the blindness, Jesus says, but rather God allows it so he can be glorified. So perhaps, in the case of the healed lame man, Jesus is speaking more about the practical consequences of sin. I can only speculate, but this man might have too often given into the temptation to be lazy, to be thankless, to blame others, to complain, to drive away any who once loved him or tried to help him. He'd forgotten how to be thankful and considerate. He'd learned to grab what he could and complain when others did the same. Perhaps if he continued on, physically healed, but with those heart-handicaps, a worse life would befall him. Heart sickness, left unchecked can ruin life and even take away life. On a personal level, we all have heart sicknesses that we harbor, and perhaps even protect behind convenient excuses and half-truths. We blame others or say we're dutifully waiting for our unrealistic "cure." But it's the intentional soul work, the intentional addressing and confessing of our sins and hurts that usually allow for real healing. And yet---this poor man-- as bitter, resigned, isolated, ungrateful, and self-absorbed as he was-- did eventually get his miracle. Jesus comes to us when we lack even a shred of worthiness. In his mercy, pity, and compassion Jesus comes and engages us. And in this story, Jesus heals and engages the man at great personal risk. After commanding and enabling the man to "do work" on the Sabbath, he invites the scrutiny of the Pharisees. He's henceforth high on their heretical hit list. He's been branded, his kindness has backfired, but he keeps on seeking out people to engage and heal. That's the kind of God we have. So, do I want to be made well? Let me take a moment to risk a little here. I've been letting this question stew in me all week, trying to hear it from Jesus' lips and answer it honestly for myself. Last night as I was drifting off to sleep, I was still thinking about it. Conversations from my most recent session with a counselor drifted through my consciousness. The counselor had identified some things in me that needed "working through." He wanted to find the root of them. At the time, I had felt like they weren't really issues in the first place. It made me think, to want to be made well, you need to be aware of and admit to being unwell. You need to own the specifics of your unwellness. In my case, there are a slew of aberrations in my personality or habits, such as my preference for not being touched, my avoidance of crowds, my avoidance of conflict, my latent fear that close friends will somehow hurt me or let me down. Yeah, I guess this list does seem a little more problematic in print. But honestly, I'd always considered these to be part of what it means to be an introvert: neutral traits, or at worst, mild nuisances or quirks. I never saw them as symptoms of being unwell. I'd considered them in terms of what other people are doing or not doing in ways that wrong me. Sometimes the hug is too tight a squeeze, sometimes the caress is irritating my sensitive skin. The confrontation seems threatening or causes my logical thinking wires to cross. The friends have let me down. In this way, I see I'm a lot like that lame man, expecting and requiring others to stop doing what they do or start doing what they don't. Jesus does sometimes seek us out and grant us an unexpected, unearned miracle healing. And more often, he engages us and warns us to own our heart sickness and sins. I'm thankful for the many channels he uses to pose questions in my heart. And now I'm wrestling with my own desire (or lack thereof) being made really, truly well. Next week: "What are you looking for?"